Mark Rayner shows you how easy it is to smarten up a bare timber fence just in time for summer. You will need: A stiff-bristled brush bucket, garden hose with clean running water, garden sprayer, paintbrush and paint stirrer. 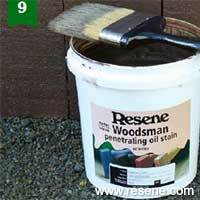 Resene Timber and Deck Wash and Resene Woodsman Penetrating Oil Stain tinted to Resene English Walnut. 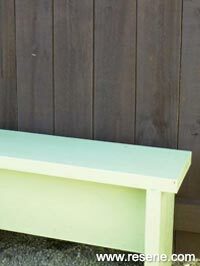 To get the look: The bench was painted with Resene Enamacryl tinted to Resene Woodstock. Top tip: When choosing a colour to stain a fence, consider selecting an effective background tone and colour for any plants growing in front. Plants with pale coloured flowers and foliage will achieve the greatest contrast against a dark fence and darker coloured sculptural plants may look most effective against a pale background. Consider too the aspect of the site – you may wish to lift a cold dark corner of the garden by staining the fence with a light or warm colour. 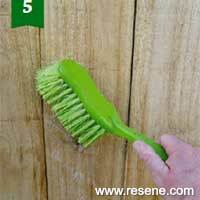 Remove any dust and dirt from the fence using the stiff-bristled brush. 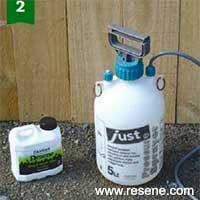 In the garden sprayer, mix one-part Resene moss & mould Killer with five-parts clean water. 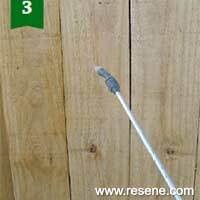 Apply a generous amount of the diluted solution across the fence, working it into the wood using a stiff-bristled brush. Leave for 48 hours. Wash off. 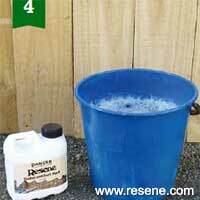 Mix one-part Resene timber and Deck Wash with three-parts clean water. 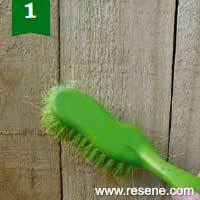 Scrub the diluted solution into the wood, allowing the surface of the timber to remain wet for 10 to 15 minutes. 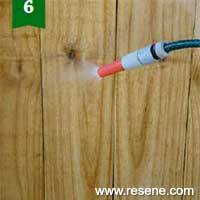 Thoroughly rinse off the Resene timber and Deck Wash with clean water and allow to dry. 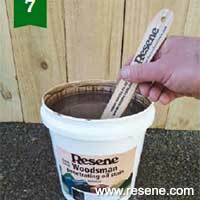 Carefully stir the Resene Waterborne Woodsman wood stain with a flat stirrer. 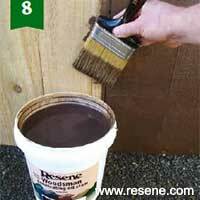 Apply one coat of Resene Waterborne Woodsman to the fence, applying in the direction of the grain. allow to dry for 24 hours. Repeat step 8 allowing the second coat to dry for 24 hours.